This weekend was the yearly ritual of the “turning back the clock”! There seems to be that there is a 50/50 split of those who enjoy the extra hour to those who would prefer time staying constant. I personally am in the category of constant, never really enjoyed turning the clock back. 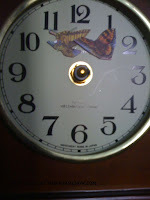 The symbolism of time, specifically turning the clock back, came rushing through every cell of my body this weekend! My “little guy” Mitch and I rushed to the Veterinary Hospital Thursday, holding him he crossed over the “Rainbow Bridge”. Saturday was the third anniversary of my father’s passing, seems like yesterday. Saturday evening learned that my precious Great-Uncle had passed that evening, he was 98 years young! Time seemed to creep along beginning Thursday and then low and behold the day comes to turn the clock back an hour. Really, say it isn’t so…. This year, like all the rest, got through the time change no worse for the wear! Monday, picked myself up and took a walk in the mountains, something soothing and healing about walking with the wind blowing in your face. The wind, to me symbolizes cleansing, blew all around me as I walked and reflected on the past 5 days. Memories, acknowledging how fast time goes when we aren’t paying attention all ran through my head as I processed. Giving gratitude for Mitch, my dad and My Uncle giving thanks while grieving for my loss and those I love. For a moment, I did think, if I could turn back time or if I could have one more moment. Ever think that about a time in your life? An important lesson I learned from my dear friend, “embrace the wind”! This day I embraced the wind as best I could and allowed the sadness and tears to be blown away. What seemed like a moment in time, my sadness turned into a Celebration of the love, lessons and impact each had on my life and others. What would we say differently? Would our dreams be different? As the Butterfly flutters near the hands of time, changing our actions our words and dream our dreams can impact our experience each moment of our lives..…. The past, the present and the eternal future! Dream, Believe and Achieve all that your Heart Desires!